The Liberty Belle is the name of the vessel that is the Liberty Square Riverboat! Hello everyone, and welcome to #Day50 of our #DisneyWorldCountdown! Can you believe that we have already counted down halfway through our list of 100 things to do at Disney World? It’s crazy how fast time flies, and before I know it, we’ll be on the road to Florida! 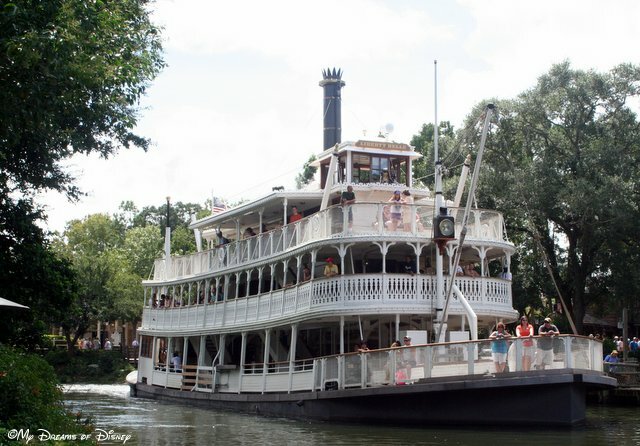 Today we are taking a look at an attraction known as the Liberty Square Riverboat, which features the Liberty Belle, named after Walt Disney’s wife Lillian, as the vessel that will take you around the Rivers of America on your journey. This is a fun, relaxing, “take me back in time” type of attraction, one that you can get on, look around the ship, see some parts of Walt Disney World that you don’t normally see, and just relax for a while. After a long day of going all throughout the parks, there are certainly times when this attraction is the perfect respite to ease your tired feet! In addition to the daytime operation of the Liberty Belle, you can also appreciate the Liberty Belle after dark when you are watching Wishes. 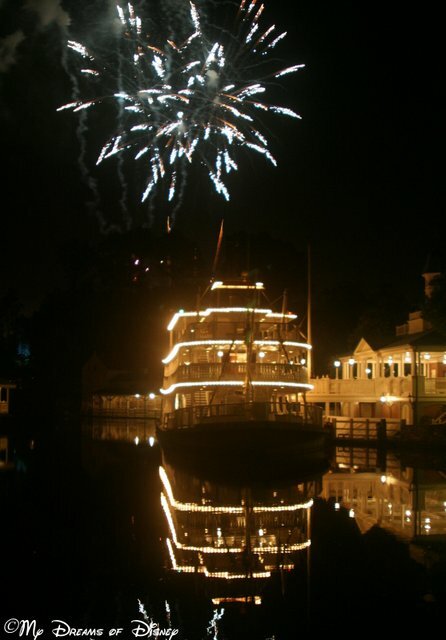 As you probably know, the Liberty Belle stops running in the evening in order to prepare for the famous fireworks show. However, the string lights are still lit, and it can be fun to get a tranquil look at Liberty Square and the Liberty Square Riverboat after hours too! Just check out this photo I took some years back. For a unique perspective on Wishes, take some pictures from over in Liberty Square! One night a couple of weeks ago I was thinking about the Liberty Belle and how cool it would be to be able to take a ride on it after dark. That got my imagination going, and I started thinking, wouldn’t it be neat if the Imagineers made some sort of special run of the Liberty Belle — perhaps during one of Mickey’s Not-So-Scary Halloween Party — and operate the Liberty Belle as a special “Ghost” ride? I think it would be quite the setting for an evening of fun — who knows, maybe they could even turn it into a special dinner show type event. I know I’m rambling a bit, but those sorts of ideas excite me. What do you think about them? 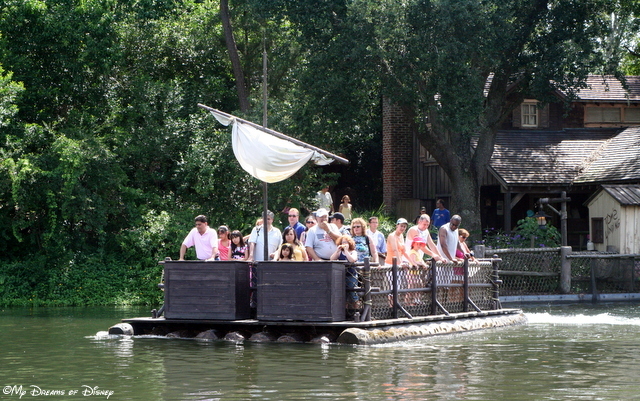 Do you and your family enjoy the Liberty Square Riverboat, or do you pass it on by? Let me know in the comments, and thanks for stopping by! 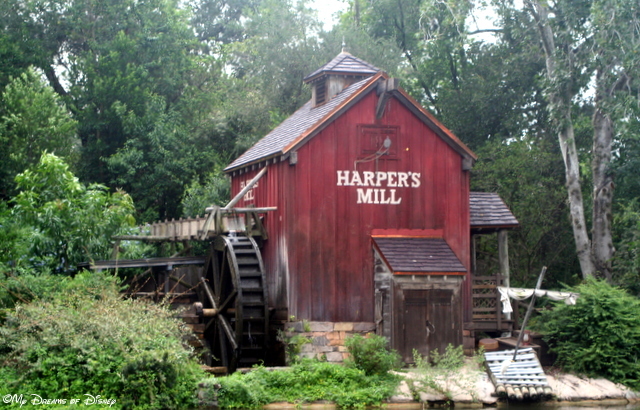 Harper’s Mill on Tom Sawyer Island takes you back to a bygone day and time! Hello everyone! It’s February 17th, 2014, and much of the country has been stuck in the deep throws of a brutally harsh winter. So harsh, in fact, that it makes us all wonder what the spring and summer will be like. My daughter’s school system has even lost 7 days of school — which is not many for some of you, but for Raleigh, NC, that’s a ton! In any event, last night I thought of a post that might help us all out with the stresses that the weather can bring. I thought, what better way to relax than by relaxing the Disney way! To start us off, let’s take a stroll around Tom Sawyer Island, located in the middle of the Rivers of America in the Magic Kingdom. Tom Sawyer Island has a lot to do! Injun Joe’s Cave — one of my favorite parts of the whole island — and on a hot day, a great way to cool off! Fort Langhorn — as you can see, Fort Langhorn is located somewhat apart from the rest, so look at it last, I recommend! When it comes to Tom Sawyer Island, I think this is a great way to take a break from the hustle and bustle of a busy Disney Day, and just slow down and take the road less travelled. 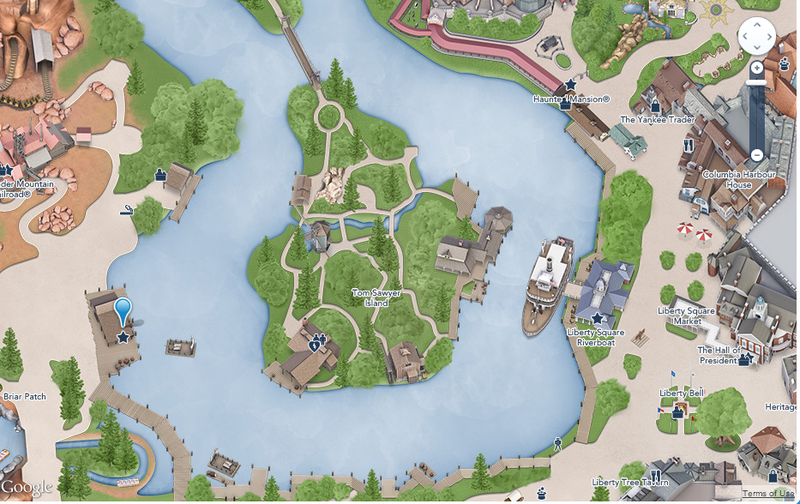 Obviously, Tom Sawyer Island is a great stop for families with young kids, but even for those that have kids (or no kids) and have outgrown it, it can be a great place to bring a picnic lunch and just chill and watch the Liberty Belle pass by. Here’s a few pictures from our days exploring the island. This is the bridge that leads to Fort Langhorn. This is my niece Stephanie enjoying the Barrel Bridge! 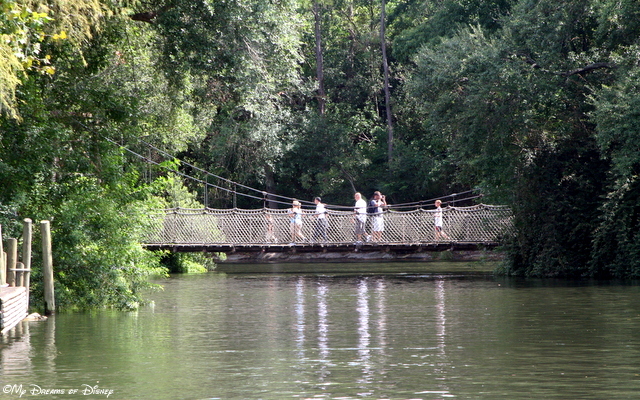 What do you think about Tom Sawyer Island? Is it a great way to relax at Disney? Or do you just not bother about relaxing at Disney? Let us know in the comments, and thanks for stopping by! 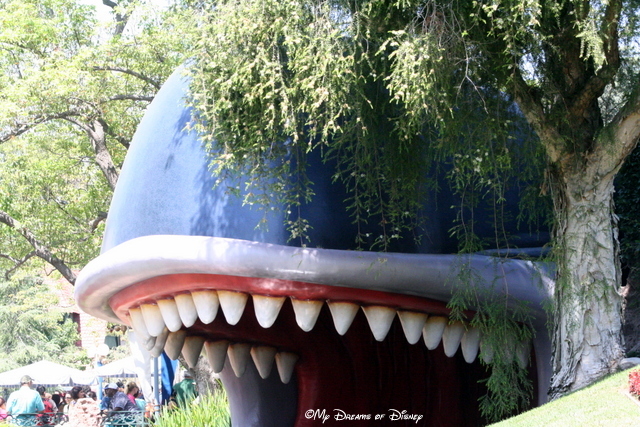 Monstro the Whale greets you on your journey into the Storybook Land Canal Boats! Hello everyone, and welcome to this week’s Tiggerific Tuesday Trivia! As always, I’m joined by my lovely and talented co-hosts Jenn from Disney Babies Blog, Heidi from Heidi’s Head, and Jodi from Magical Mouse Schoolhouse, and we’re sharing with you some of our favorite trivia! Today, I’m taking a look at one of the most charming of attractions at Disneyland — the Storybook Land Canal Boats ride! I’ve got several tidbits of trivia, so I thought I would list them out here for you. Enjoy! Did you know that the attraction is an opening day attraction at Disneyland, and has been open ever since? The canal contains 465,000 gallons of water, and is pumped to the moat for Sleeping Beauty Castle, the water for the Jungle Cruise, and the Rivers of America before it is pumped back to the canal. Now that’s a lot of water! 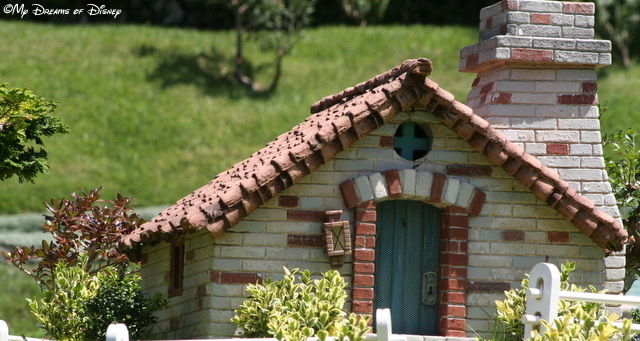 The houses in Storybook Land are fitted with 6 inch doors, and 1/4 inch hinges that actually allow the doors to open and close so that the Imagineers can change the light bulbs! 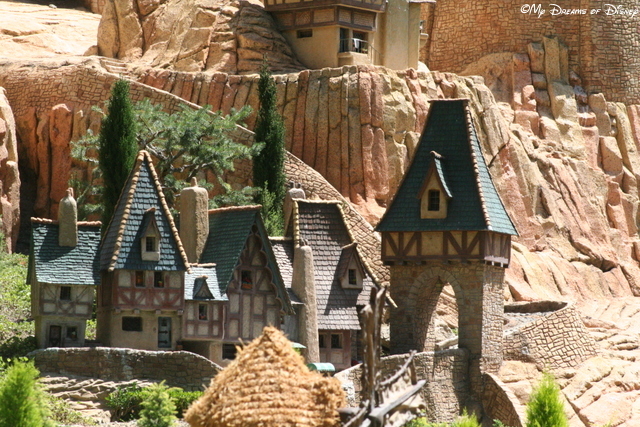 When I think of the Storybook Land Canal Boats ride, I think of the relaxing nature of the ride, the great information from the narrator/boat captain, and the incredible use of perspective to make it seem like we are looking down a distance to the houses. However, take a look at these photos — some of them look like they are big enough for us to enter! One of the scenes in the Storybook Land Canal Boats ride. One of the houses with doors that open. Thank you for stopping by today, now, please go take a look at the rest of the entries by clicking on the images below! Afterwards, go out and make it a Disney Day everyone! Hello everyone, and welcome to this week’s Tiggerific Tuesday Trivia post! Thank you for joining Heidi from Heidi’s Head, Jenn from Disney Babies Blog, Jodi from Magical Mouse Schoolhouse and myself for some great Disney trivia! Today we are taking a look at the Rivers of America at Disneyland! I hope you enjoy today’s trivia! I hope you have enjoyed this weeks look back to 2003! Until next time, make it a Disney day! Do you have a blog and would like to contribute to our collection? If so, we would love to have you join up! Just create a post and publish it, copy your post link, and submit it to the list you see at the bottom! It’s really quite simple. Now, go and check out the other great entries this week! The Lands of Disneyland: Critter Country! 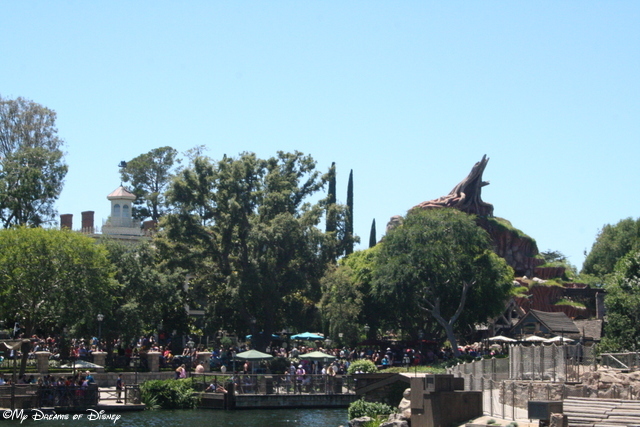 From the Sailing Ship Columbia, this shot of Haunted Mansion and Splash Mountain looks great! On Tuesday we continued our look at the Lands of Disneyland by taking a peek at all that there is to explore at Frontierland! Now, we are moving on to Critter Country, next on our list of the Lands of Disneyland series! 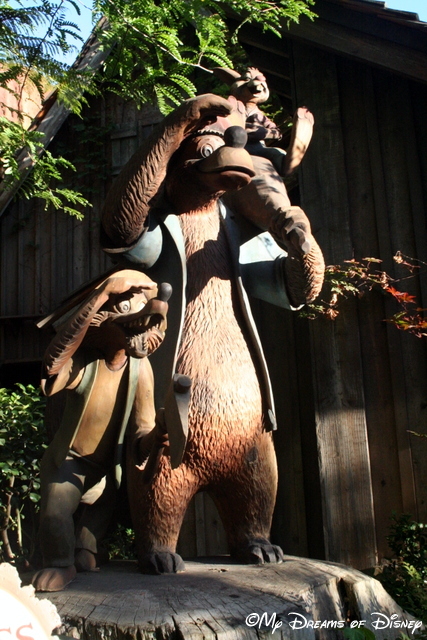 Did you know that Critter Country is actually the third name this land has had? When it first opened in 1956, it was known as Indian Village. It featured Native American shows and attractions, including the Indian War Canoes. Actually, at this time, Indian Village was part of Frontierland. However, in 1971 it was re-themed, and renamed Bear Country, and was officially made a “Land”. It opened on March 4, 1972, and featured the Country Bear Jamboree as it’s centerpiece attraction. It would stay as Bear Country until 1988, when it was renamed Critter Country in anticipation of the January, 1989 opening of Splash Mountain. It has been Critter Country ever since. Splash Mountain is very much like the Splash Mountain at the Magic Kingdom. Splash Mountain at Disneyland is very much like Splash Mountain at the Magic Kingdom, but there are some differences. The two biggest differences are that the Disneyland version features a single seat log flume — and let me tell you, it was a lot of fun when we rode it — and also, the Disneyland version doesn’t have a lap bar like the Magic Kingdom version does. Other than that, really, it’s the same ride, all based off of the movie The Song of the South. The Winnie the Pooh ride is basically the same as the Magic Kingdom version, but the queue is different. Another great factor for when we visited was that it had hardly any line all the time, so we were able to hop right on. Also, it is located right across from Splash Mountain, so it is pretty easy to find. The map does a great job of showing all the different parts of the land. This canoe ride is one that we didn’t get around to, but I think would be fun — and tiring! 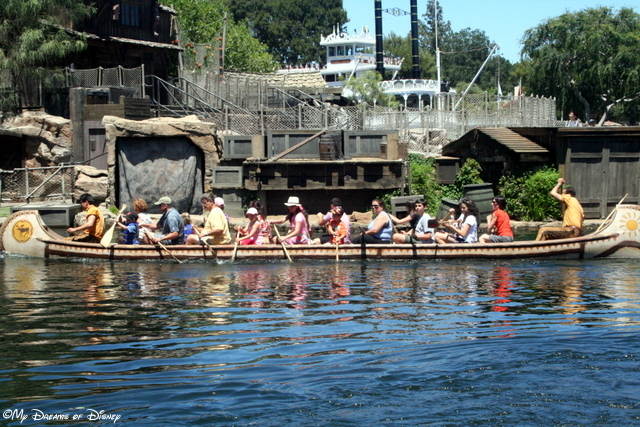 The third attraction in this small land is the Davy Crockett’s Explorer Canoes attraction. 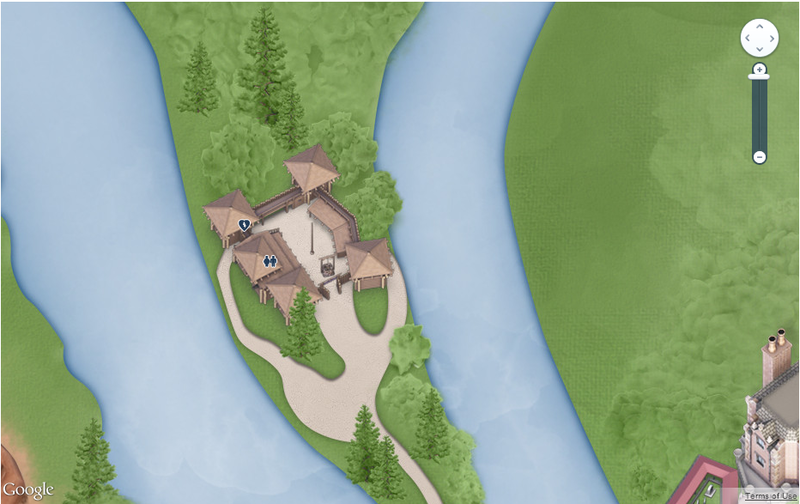 While we didn’t participate in this attraction, I think it would be fun to do once — and get a totally different view of the Rivers of America and surrounding lands. In addition to these three attractions, you also have the Harbour Galley and the Hungry Bear Restaurant to fill your tummy with — both of them are quick service, and while we didn’t eat at either one of them, I think we would have liked both of them. Critter Country, while it is a small land, features arguably one of the best attractions in all of Disneyland. Along with The Many Adventures of Winnie the Pooh, Davy Crockett’s Explorer Canoes, and the dining establishments, this land is definitely not one to be forgotten! Make it a part of your day at Disneyland every trip! What do you think of Critter Country — one of your favorite lands, or one to skip past? Let me know your thoughts in the comments, and thanks for stopping by My Dreams of Disney — where we are helping you turn My Dreams of Disney into Your Dreams of Disney!